Continued sluggishness in the global economy is putting special pressure on companies in asset-intensive industries. These companies are operating well below capacity, and the weak demand has prevented them from passing on the full costs of raw materials and energy, for which prices remain stubbornly high. Many producers of steel, aluminum, and other metals have seen their margins fall into negative territory—especially in Europe. (See Exhibit 1.) With no end to this difficulty in sight, companies have responded with a variety of cost-cutting meas­ures. Yet these steps usually fail to reduce expenses beyond the short term. To truly meet this challenge, companies need to think holistically by addressing strategic and operational questions at the same time. Such an approach does not mean companies should simply reduce their size by permanently closing weaker factories and other assets. Instead, BCG has found ways for companies to stay profitable when market demand is low while retaining the ability to serve customers when demand eventually returns. The key is to focus not on cost cutting per se but on using expensive assets with a more flexible approach. By building flexibility deep into its operations, a manufacturer can move more confidently into the future. Metals producers are struggling because they have made heavy capital and operational investments in expensive factories and supply chains. They prospered in times of high utilization—from 2003 to 2007, for example, when global demand was strong. But since the financial crisis, world demand for these commodities has stagnated, and margins have collapsed. This is an old story for cyclical industries, but the situation is different this time. Few forecasters expect global demand to regain its previous rates of growth anytime soon—and there is near unanimity that European demand will stay depressed. Meanwhile global capacity will remain high as new factories in emerging markets continue to start production, and political pressures hamper European companies from retiring plants with weak local demand. Finally, prices for both raw materials and finished metals have become much more volatile, further damaging margins. A challenge as deep-seated as this one requires efforts at the strategic as well as operational levels. We have developed a framework for these companies that we call Flex in Operations; it is made up of five elements as outlined in Exhibit 2. Flexible Assets. The solution should not start at the factory level, which is where most company leaders have looked as they try to cut losses. Instead, they need to look at the company’s portfolio of plants and aim for flexible assets. The goal is to use an asset only at the level at which it can operate at or near full productivity. All other assets should be mothballed until demand resumes, with capital expenditures adjusted accordingly. Flexible Operations. In order to achieve asset flexibility, the entire organization has to be flexible as well, beginning with operations. Companies can accomplish a great deal by standardizing work and using data to rationalize and synchronize activities. Flexible Organization. Making operations flexible will free up labor, but it need not bring reductions in force. Companies should have a corresponding flexible organization, which makes it possible to move employees around. They can establish flexible but dedicated positions—and, as a result, use far fewer temporary contractors during slow periods. Likewise, leaner local-management structures can speed up decision making and improve motivation. Support activities that involve sharing and learning can be shifted to the center, where the entire organization can benefit. All of these steps allow companies to boost flexibility without increasing costs. Flexible Raw-Material Consumption. As executives start to operate their plants as a true portfolio, they’ll want to adjust their raw-material inflows to different factories according to the current or expected level of demand. Purchasing can also become more sophisticated about calculating the true cost of materials, not just the outward price—and can promote smarter energy use. Flexibility Enablement. At most companies, the above four elements amount to a transformation in operating outlook and culture. Even under the present economic difficulties—when change might seem necessary—companies will need to work hard to motivate their people to get on board. Flexibility enablement is a crucial element of the overall framework; it requires strong executive sponsorship, stakeholder encouragement, and an activist project-management office. Many companies have already addressed one or more of these elements to improve operational performance. Optimizing any of them individually, however, is usually too limited to be sustainable. Flexible assets, for example, can only be achieved if work practices and processes are standardized. Otherwise, shifting products and employees to new plants and work areas will not work. At the same time, the various organization structures within the operations of a company need to be comparable so that leaders can ungroup or regroup different shifts, teams, and experts. Flex in Operations can therefore only succeed as an integrated approach addressing all five elements. Everything starts with the highest-cost factor: the assets themselves. With their fixed and highly capital-intensive asset base, many companies struggle intensely in times of stagnating or declining demand—and increasing demand volatility adds to the challenges. Companies have to learn how to remain profitable when demand levels are fluctuating. Achieving flexible production is not a trivial undertaking, but the effect is considerable. Examples show that it is possible to design an asset footprint capable of absorbing 30 percent of demand fluctuations. Establishing such a flexible-asset footprint rests on two components: setting up a demand-based footprint and managing asset shutdown. The core asset configuration comprises the minimal set of assets that are required to fulfill the demand at the very bottom of a cycle. Here, deprioritized assets are shifted or mothballed. Flex scenarios are distinct operating points that a company can move to in upturns; specific assets will resume operations at predefined points. These scenarios clearly prioritize which assets will suspend operations in a downturn and which will be used to “flex up” again. To develop such a flexible-asset footprint, it is essential, first, to define the product mix that will constitute demand along the cycle. Second, it is critical to determine which assets can fulfill demand most cost efficiently and to actively rule out less favorable interim steps. Depending on the industry, this can free up preproduct capacity to fully load other assets and focus management’s attention on efficiently running the core assets during a crisis. Establishing such core and flex scenarios will prevent a company from wasting efforts on suboptimal operating points throughout the cycle. The company needs to decide which orders to take on so that it can reach the next-best operating point. That way, it can actively move from one favorable configuration of the asset footprint to another. For example, a steel-coating company managed to consolidate production from five to four lines. This increased overall capacity utilization from 73 percent to about 92 percent, and yielded an EBITDA increase of €4.5 million and a working capital release of €2.6 million. To achieve such an improvement, structured asset-shutdown management is required. Managing Asset Shutdown. Moving between core and flex scenarios means mothballing assets on short notice. To do so successfully, companies need to be prepared in three ways. First, customer orders need to be shifted from one production line to another, or even to a different plant. Many companies have never considered supplying a customer through an alternative route. Doing so requires standardizing grades, qualities, and other processes across the company, and trial runs with customers have to be available as a contingency plan. One client standardized galvanized products so that two production lines (instead of one) could fulfill customer requirements and be used flexibly. Second, the concept requires buy-in from the workforce since there will be a number of employees working in noncore production lines. When an asset is mothballed, the company needs to have attractive measures in place to retain skilled labor. Examples of proven measures that can bridge the mothballing period include flexible contracts with banked-hour schemes, moving core personnel to other assets and thus replacing agency labor, and using government “short labor” programs to supplement worker pay. One company decided to design a flexible production model for an integrated plant, preventing losses at the bottom of the cycle and increasing returns in peak periods. This occurred in three steps. First, the leadership team defined two optimal production points for the plant’s output capacity. The core scenario at the bottom of the cycle allowed for 30 percent less volume than the highest flex scenario. Second, it prioritized its rolling mills for different demand scenarios. One of the mills turned out to have two good properties: several utilization points with nearly optimal costs and contribution margins low relative to those at other rolling mills. Therefore, this asset could be either used as a capacity outlet or mothballed, depending on demand. Third, the company negotiated this flexible-asset-footprint concept with its workforce and achieved consensus. The effort eliminated losses at the bottom of the cycle by cutting more than 20 percent of fixed costs. It also allowed the company to flex up volume substantially by adding back only marginal costs. Just as standardized production makes it easier to shift customer orders around, standardized work procedures facilitate the movement of labor. Companywide maintenance and repair protocols, response plans for deviations from control parameters, and other guidelines enable technicians to work in a variety of areas and plants. Through such approaches, departments are better able to pool their personnel and introduce “artisan” operators capable of both maintenance and operational tasks. Standardization does impose some up-front costs, especially in operational adjustments and training. Yet it brings a number of benefits besides flexibility, such as better-informed management, better-timed workflows, and the reduction of activities that don’t add value. Data-Driven Performance Management. Standardized procedures enable managers to compare activities in one mill with those in others, raising quality in lagging areas while promoting companywide consistency. Organizations can take what’s learned in one area and apply it systemwide. Managers can draw on more data points as they manage performance—amending their “gut feeling” by acquiring an analytically validated understanding of why performance varies. Cause and effect can still be hard to discern, even with precisely measured and relevant data. But data analysis experts, working either in-house or in cooperation with outside institutes, can help draw out patterns. We’ve seen data-driven companies improve performance by 10 percent or more on metrics such as volume, yield, and customer complaints. Takt time analysis makes it possible to develop a synchronized and repeating operating rhythm, with tight scheduling, that reveals and helps reduce production bottle­necks. Scheduling equipment and personnel around this standard, with carefully maintained buffer levels, saves on operating costs while stabilizing processes. A metals processor set itself ambitious goals for increasing production and reducing direct operating costs. The goals were driven by relentless pressure on the cash cost curve, which resulted from stagnating prices and overcapacity in the global market. A joint BCG-client team subjected all parts of the continuous operating process to both database analyses and extensive shop-floor observations, as well as to detailed root-cause analyses to establish a sound fact base. This fact base led to ten initiatives, including productivity enhancements and the introduction of artisan operators. The company also improved synchronization of operations and maintenance using a standardized set of procedures, which were executed based on buffer levels to avoid blocking or starving the bottleneck process. The results were a 9 to 15 percent increase in the production level (dependent on the metal produced) combined with an 8 to 10 percent decrease in nonenergy operating costs. The result of achieving flexibility across plants and within work areas is greater productivity, which leads to excess workers in general and throughout the business cycle. Managing the variable need for workers will be the major organizational challenge. But companies can improve their flexibility in other ways as well. A capable organization is the backbone that sustains Flex in Operations. Flexible Staffing. The goal is an organization that can breathe in and out with variable demand. Plants should have dedicated roles but with flexible assignments. At the core level of demand, companies will rely mainly on employees. As demand revives and flex plants start up, contractors should take on most of the positions, leaving the hiring only for workers with irreplaceable capabilities. And those in-house workers require special attention, as companies will want to retain skilled personnel at the mothballed flex assets. Training programs can take up the slack in the short term. Some people will be willing to relocate to core plants or production lines, and others will be satisfied with variable contracts that give them some support based on overtime hours during busy times. Local governments may be able to help by making up lost salaries for employees who are given shorter hours. Even though some layoffs of employees may be inevitable, companies should look first to reduce spending on contract workers. Moving employees into freed-up contractor roles is one of many staffing decisions that will require negotiations with unions or government agencies, all part of the extensive advance planning required to bring about flexibility. Lean Organization Structures. Beyond the shop floor, companies will discover opportunities to minimize organization layers and consequently increase the span of control. This move generates cost savings, more effective decision making, and high individual motivation due to broader responsibilities—increasing motivation for “stayers” but also urging parts of the workforce to leave the organization. In a manufacturing organization with 15,000 full-time equivalents, five layers between general manager and operator—resulting in a span of control of more than 11 on average—are typically considered optimal. Bundle activities with a high sharing and learning potential in one central location. Within the technical functions, for example, this would apply to research and development and new-product-development activities. When immediate reaction and close proximity to production are imperative, make functional and supporting activities primarily local with a direct reporting line to the respective manufacturing manager. Activities between these two ends of the spectrum, such as technical customer service and continuous improvement, should be centrally coordinated but locally executed. This helps to avoid redundant work by using resources in a sequenced and flexible manner. It also allows for balanced harmonization and customization needs (such as process standards) among assets, products, and customers. A metals company was struggling with key production and quality metrics such as “first time right.” The root cause was decentralized technology departments that neither supported sharing and learning across sites nor provided guidance on how local assets could excel in manufacturing. The company reorganized this function according to three principles. First, it established central steering of the technology function, with direct reporting to the executive committee. Second, it integrated all sharing- and learning-related subfunctions into a central function. Third, it rescoped all subfunctions that were directly related to production and established direct line reports to the respective production manager. R&D and product development remained central to generate synergies and allow for a better understanding of customer requirements. Yet time-critical activities such as testing, process improvement, and technology remained local at the assets to ensure proximity to manufacturing. The departments for product portfolio management and technical customer service were coordinated centrally to save overhead while remaining local to avoid duplication and to allow for asset-, product-, and customer-related specifics. Overall, 28 percent of technical full-time-equivalent positions were identified as redundant. Setting up a flexible footprint has major implications for the consumption of raw materials. Because contracts for these raw materials have now become much shorter in duration—often only three months—purchasing will need to handle the move from core to flex and back again without building large inventories. A harder challenge has to do with the efficiency of this consumption. That’s because most plants were built at a time when the price of these raw materials, especially energy, was relatively low. The steep rise—as well as the volatility—in prices now puts a premium on efficient use of these materials. Investments in the Efficiency of Core Assets. All but the newest metals plants are likely to benefit from capital investments or process improvements to reduce their consumption of raw materials. Most of these investments, however, are expensive—from better thermal insulation to upgraded electrical steering units. Companies have to be selective. Core assets, in continual operation, should get the lion’s share of the upgrades. Flex plants will have a much higher bar to reach in order to justify the improvements. Indeed, high energy costs are a major reason why flex plants should be fully mothballed during a down cycle rather than put on partial shutdown status that continues to burn some fuel. Beyond a flexible footprint, many companies will also find it cost effective to invest in demand management that makes use of cogeneration capacities. Such investments depend on contract terms that typically vary energy prices depending on, for example, the time of day or peak demand. Storing gas from manufacturing processes for deferred use in cogeneration is one way to help reduce costs during high-price periods. For example, a steel manufacturer managed to save a significant amount of the cost of electricity from the grid by improving site electrical load management to avoid triad charges as a payment pattern of its energy contract. Peak load periods were thoroughly monitored. During triad warnings, noncritical assets were taken off the grid while cogeneration was brought to maximum output to feed critical assets. A metals company was purchasing ore from mine A. The purchasing decision was based on two advantages that ore A had over ores from elsewhere: lower freight cost and more top gas credits. A team that included both purchasing and operations experts from the company, however, improved the material choice by taking into account the effect of different ore specifications on operations. The analysis revealed that ore from mine B was the superior choice. 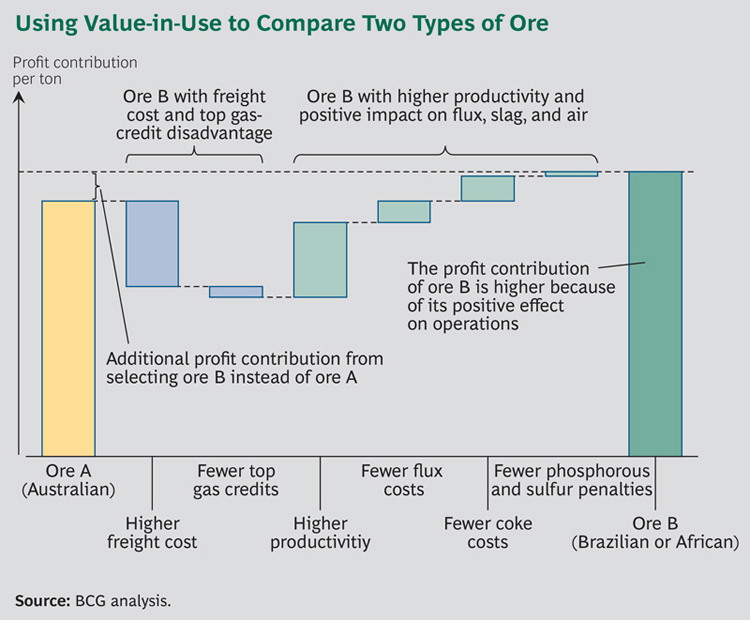 Ore B had higher resulting productivity and a positive impact on flux, slag, and air pollution—all of which more than compensated for ore B’s disadvantages in freight cost and top gas credits. Once the change was made, the profit contribution per ton of ore was increased by 12 percent. All of these efforts mark a major change in how metals companies have traditionally operated. Instead of having a collection of largely autonomous plants, companies need to move toward centralized coordination and decision making. Only then can they achieve substantial flexibility across assets and reap the full benefits of that flexibility on the factory floor, in support activities, and in raw materials. Especially in Europe, current industry pressures have risen to crisis levels—a situation that should help motivate stakeholders to change. Yet these changes run against deeply entrenched legacy practices. The CEO and other executives on the leadership team must lay the foundation for success in three vital ways. Accountable Leadership. First, leaders must be willing and able to engage directly and to lead the transformation. These changes will prove far too complicated and controversial to be handled by normal management channels. Plant managers will lose some of their authority and discretion, and no one wants to see his or her own mill shunted to the flex list. Leadership team members can start by analyzing the overall team’s existing capabilities and potential for improvement. From there, they can develop a leadership coaching and training program to help the team rise to the occasion, and in some cases supplement the team with managers from other parts of the company or outside. No matter the mix, the team must take full accountability for the transformation and speak with one voice. These leaders are the catalysts for engaging the entire organization. Stakeholder Management. Leaders must also invest in a full-scale communications program for stakeholders at every level. Stakeholders include not just employees and suppliers but also governments and local communities. All must be engaged so they understand and support the transformation. Rumors of mothballing can easily lead to fears of permanent shutdown—when, in fact, flex status is a way to prevent such a move. Once the team communicates the basic rationale and plan, it needs to be ready to reinforce those ideas on a regular basis. The team can start with monthly updates to plant managers and other executives, who can cascade the information into their areas. Transformation Management. With the communications set, it’s time to engineer the changes themselves. That requires an activist project-management office (PMO), which should emphasize the structural changes essential for flexibility: developing a demand-based footprint, standardizing outputs and work activities, rethinking the balance of employees and contractors, centralizing some local support functions, and focusing efficiency investments on core assets. These will likely involve hundreds of separate initiatives, the sources of which can come from gap analysis, benchmarking, and sharing and learning throughout the manufacturing units. By focusing on systemwide flexibility, companies can achieve the substantial—and sustainable—efficiencies that they’ll need to survive. Setting targets for this work starts with a thorough baselining of key financial and nonfinancial areas of operations: ranking the plants or mills by efficiency, charting the current level of standardization, assessing how local support functions are, and analyzing the productivity of current raw-material flows. KPIs such as the number of employee full-time equivalents and the speed of work measured in tons per week will get the most attention. From there, the office can set ambitious targets, which are typically 30 percent greater than the original target. Because of the uncertainties involved and the magnitude of the effort, some initiatives will surely fall short. The PMO has to set in stone the baseline and the targets—and then communicate them widely. With regular updates on progress over time, the PMO can use these numbers to coordinate and drive the many individual steps that need to happen at a multitude of locations in order to establish a flexible structure. As the new structures come into place, the office will also watch the baseline metrics to ensure that these improvements actually hit the bottom line. Asset-intensive industries in Europe and elsewhere are facing deep structural challenges. Demand is likely to stay depressed, while the prices of energy and other raw materials will stay elevated. Without better utilization of these assets, companies will struggle to regain profitability. Flex in Operations improves utilization and reduces costs by addressing all aspects of an organization, from asset shutdown to coordination on the factory floor. Achieving Flex in Operations requires work in the five elements of the flexibility framework. Executives must ask themselves whether their company has the organizational capacity to boost utilization and related efficiencies in these areas—and if not, how to develop such capacity. Flexible Assets. Do we have a schedule in place to determine which assets to use at different levels of demand, and are we capable of shutting down or starting up assets on short notice? Flexible Operations. Have we standardized our output and work activities in order to shift customer orders and skilled workforce as needed? Flexible Organization. Do we balance central and local support functions to promote organizationwide learning and coordination, while still being responsive to local conditions? Flexible Raw-Material Consumption. Have we assessed the opportunities to reduce energy demand and optimize energy usage, and have we invested in line with local prices and the flexible footprint? Can we evaluate raw materials according to their full cost—rather than simply price? Flexibility Enablement. Can we as a leadership team master the complexity of this large-scale improvement program and motivate our stakeholders to change? We estimate that Flex in Operations can reduce a company’s total costs by 4 to 9 percent. That’s enough to turn a money-draining organization into one that’s holding its own. Although companies may adopt flexibility in order to overcome the current crisis, we also see it as a major opportunity for the future. Leadership teams that master flexibility will be well positioned for eventual industry consolidation. This report is produced by BCG’s Industrial Goods practice. The authors would like to thank BCG partner and managing director Alexander Koch for his insights in the preparation of this report, as well as their BCG colleagues Volker Brinkmann, Christian Hense, Wilfried Hofstetter, and Georg Kappen. In addition, the authors thank John Landry for his help in writing this report, as well as Katherine Andrews, Gary Callahan, Sarah Davis, Kim Friedman, and Sara Strassenreiter for their contributions to its editing, design, and production.